The Rubik's cube was first invented by Hungarian architect Ernő Rubik in 1974. 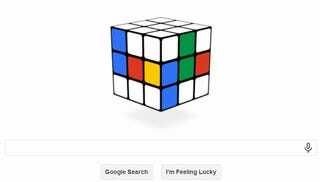 Google is commemorating this achievement with one of its trademark Doodles that lets you play with the legendary toy in the comfort of your own web browser. Head over to Google.com to give it a whirl. But be warned: as the New York Times recently observed, there are (roughly) 43,252,003,274,489,855,999 ways to mess this up. If you need some help finding the 43,252,003,274,489,856,000th movement that puts everything in its rightful place, there are a number of handy guides online. Business Insider has a good one, and wikiHow is as reliable as ever on the cube front. But my personal favorite comes courtesy of The Onion.